This mug would have been great if I had seen this last month in time for the showing of the Hulk. But for now, let's not think or talk about the movie (even if it was nice! 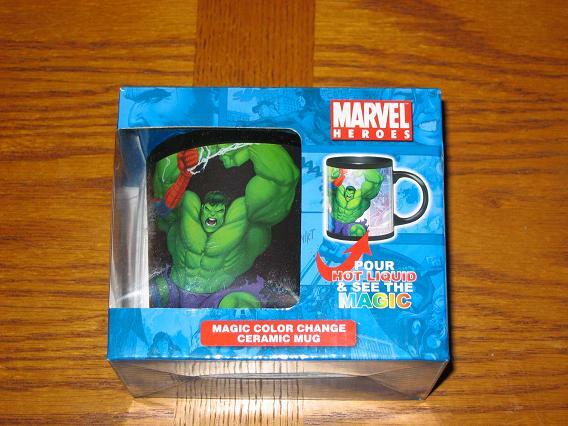 ), let's talk about the Color Changing Hulk Mug. When you pour a hot liquid into the mug a backround appears with scenes from comic stories. So for all Hulk Fans and Coffee Lovers out there, this is THE mug for you. It will be nice to have it in your office or anywhere where people can see you using it. Enjoy the moment of being popular while Hulk is beside you.